Boston University students, with the help of friends and family, filled large laundry hampers with belongings as they moved into their dorm rooms. They’re coming to Boston. And they’re hungry for pizza. In Allston, Alex Salerno, assistant manager at a Domino’s, said his shop was expecting to dish out twice as many pizzas — between 400 and 500 — to hungry movers on Tuesday as students flock back to town. 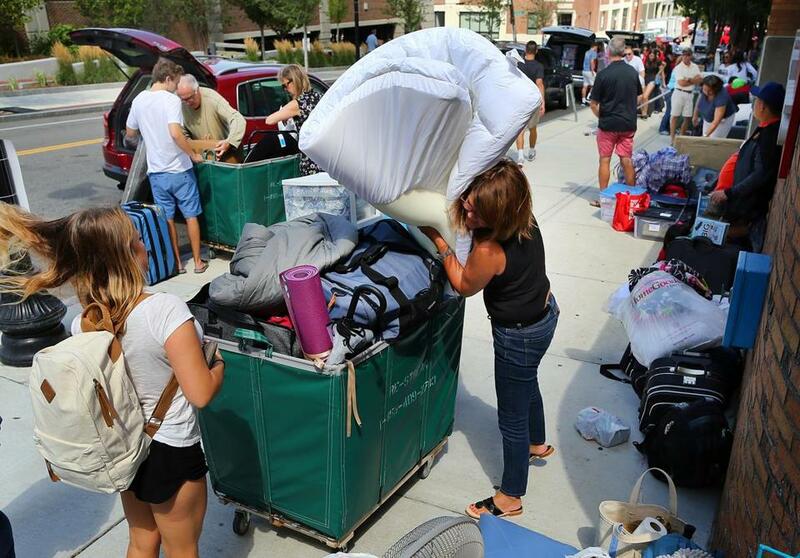 Boston’s annual move-in week, which will reach its crescendo Monday and Tuesday, will see thousands of students and others moving into — and out of — apartments in the city. Student-dense neighborhoods, such as Allston and Mission Hill, will be littered with furniture discarded by people moving out. Thoroughfares will be clogged with moving trucks. Store shelves will be emptied of nest-feathering essentials. 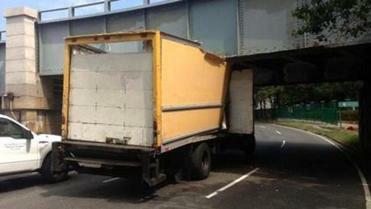 The parkway overpasses have long troubled truck renters who underestimate how tall their vehicles are. City officials vow that the move-in process will run more smoothly this year than in the past. The city has been working with landlords and universities to stagger the moving chaos through Labor Day, instead of cramming it into a 48-hour window, said William “Buddy” Christopher, commissioner of Boston’s Inspectional Services Department. Boston has more than 164,000 rental units, according to the 2013 American Community Survey. About 63 percent of rental property leases in the city begin on Sept. 1, said Ishay Grinberg, founder and president of Rental Beast, an online platform that connects tenants, landlords, and property managers. While some people will renew their leases and stay put, many will not. Boston reported last week that 2,088 moving truck parking permits had been booked for the days surrounding Sept. 1. In Cambridge, hundreds of truck parking permits have also been approved. Temporary traffic and parking restrictions will be in place in Allston, Mission Hill, Brighton, Fenway, and Roxbury to ease congestion associated with the moving process, said Tracey Ganiatsos, spokeswoman for the city’s Transportation Department. Ali Pappianne, a BU junior, got help from her dad moving into an apartment on Buswell Street. 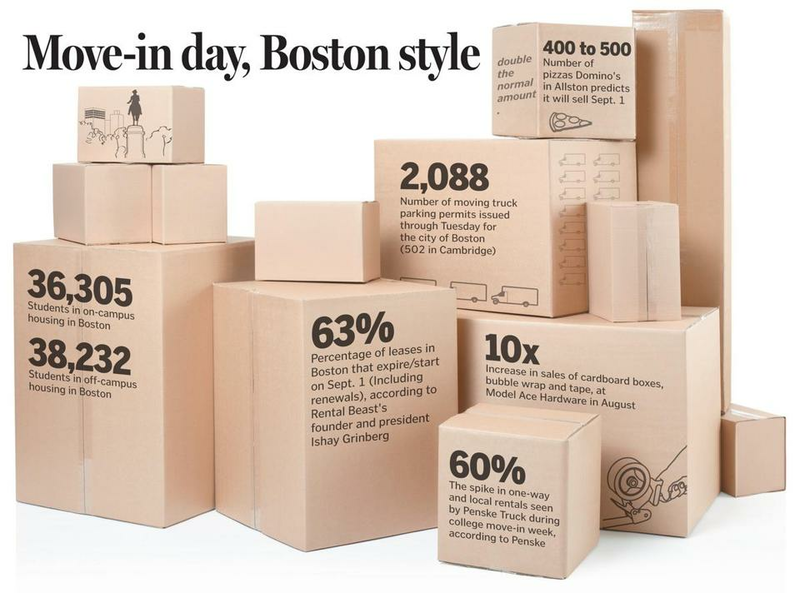 For Boston businesses, the flurry of activity offers opportunity, as last-minute shoppers flock to local stores in search of home essentials, packing supplies, and spicy nourishment for those who lent a hand. Kevin Cunningham, owner of Model Ace Hardware in Allston, said the shop’s sales skyrocket in the days before and just after move-in week. Top selling items hint at a plugged-in generation: power strips, extension cords, and HDMI cables. Cleaning supplies, shower curtains, clothes hangers, toilet seats, smoke and carbon monoxide detectors, and paint are also big sellers. But no items that are more popular than cardboard boxes, bubblewrap, and tape. Cunningham estimated the store’s sales of those are 10 times higher in the month leading up to Sept. 1 than any other month of the year. D uring move-in week, Penske Truck Rental typically sees a spike of up to 60 percent in one-way and local rentals into the area, according to Penske spokesman Randolph P. Ryerson. C omcast installs twice as many packages in the Boston area in September than during other months of the year, said a company spokesman. He predicted that thousands of cable boxes will be processed in the next few weeks by Comcast’s Boston warehouses. Neal Wigetman, founder of Basics Carpet and Furniture, said Sept. 1 is “without a doubt” the busiest day of the year for his two shops, located in Allston and Cambridge. “It takes us all summer to prepare for this,” said Wigetman. On move-in day, the business delivers more than 100 mattresses, Wigetman estimated, and customers pour into the shops looking for last-minute essentials. Customers he sees on that day are typically frustrated and exhausted, Wigetman said, listing out the many potential reasons why: They’ve spent hours maneuvering a large truck through gridlock traffic, packing and unpacking, lugging boxes and furniture from one apartment to the next, and maintaining a grateful attitude around family and friends who are pitching in but also getting on their nerves. But, he said, he and his staff try to stay calm and patient. “We try to make it fun and an enjoyable experience instead of a day of misery,” said Wigetman, sympathizing with the harried who will collapse after the end of a long day —some on a couch, some on the floor, and some, undoubtedly, on his mattresses. Catherine Cloutier can be reached at catherine.cloutier @globe.com. Follow her on Twitter at @cmcloutier. Matt Rocheleau can be reached at matthew.rocheleau@globe.com. Follow him on Twitter at @mrochele.